Le Fontane, located aft on Deck 5 (Petrarca Deck), is decorated in blue and dark-wood accents, offset by cream-colored walls that offer sea views through large, round windows. Interior walls are painted with European landscapes depicting fountains and monuments. White tablecloths and flowers adorn the tables, which offer various arrangements, including booth seating. 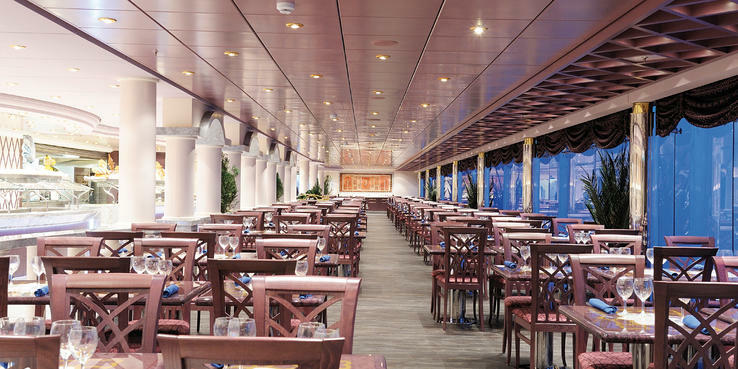 Il Palladio, positioned aft on Deck 6 (Dante Deck), is mostly red in color, accented with light-wood pillars, brass railings and gray marble. Seating is similar to that found in Le Fontane, and large, round windows offer sweeping views. One note: be careful of random, single steps at various locations. They're difficult to see, and we saw several folks trip on them each night. Menus (your waiter will bring you one in English) change daily, but they always include the following categories: appetizers (calamari, fruit plate), soup & salad (tomato seafood soup, cobb salad), main courses (linguini, steak, risotto, salmon), and desserts & fruit (gelato, apple crumble, lemon cheesecake, baba). There is a decent mix of pasta, meat and fish dishes, as well as vegetarian options, so there's something for everyone. Generally, everything we tried on our sailing was fantastic. Waiters were attentive, efficient and friendly, but service wasn't excessive or over-the-top like it can be on some American ships. Dinners are leisurely, and portions are smaller than Americans might be used to, but it makes for a better experience (and less regret, as you're not as likely to overindulge). If you'd like seconds, waiters will happily comply. Sometimes themed nights are offered; on our sailing, the third night was "Festa Italiana," which offered Italian food and decorations. Casual, open-seating dining is available daily in Le Fontane for breakfast and lunch. Times vary according to the ship's port schedule, but they are listed in each day's program. Lunch items included mozzarella sticks, crab cakes, minestrone soup, Greek salad, Indian vegetable curry, veal parmigiana and rather tasty chicken paninis. Desserts included chocolate brownies and New York cheesecake. Villa Pompeiana, aft on Deck 13 (Foscolo Deck), is the ship's buffet. It's open daily for early-riser breakfast, followed by regular breakfast, lunch and dinner. (Times vary and appear in each day's program.) This venue offers everything from pancakes, bacon and omelets to a deli station and pizza. Of course that's in addition to other standard buffet items like chicken, beef, pasta and desserts. You'll also find fruit, a salad bar and a beverage station. One section of the buffet is also open late at night for drinks and snacks. You'll find premade deli sandwiches and a rotating list of treats like crepes and ice cream throughout each sailing. Kaito, the ship's fee-extra restaurant, specializes in sushi. Menu offerings are priced a la carte, and for a total of $18.50, we scored a cucumber roll, a generous portion of teriyaki chicken and some green tea ice cream -- all of which were absolutely fantastic. There's a relaxing ambience, courtesy of calming sage-green marble, dark wood and calming music. Reservations are probably a good idea, but during our lunchtime visit, it wasn't crowded at all. It's open from noon to 4 p.m. for lunch and again from 6 to 11 p.m. for dinner daily. At the ship's Mojito Bar, near the Cayo Levantado Pool on Deck 13, you'll find amazing Italian gelato. Although it's for-fee, the large (three scoops) will set you back less than $3. There are tons of flavors, but you'll find 16 available at any given time. (If you're a fruit fan, try the banana or pineapple. For nut-lovers, the pistachio and hazelnut are must-haves. And, for the less-adventurous, there are standard but tasty chocolate and vanilla options, too.) You'll also find soft-serve ice cream machines at both ends of the Lido Deck; oddly, they aren't available 'round-the-clock. Room service, however, is available 24 hours a day, offering a limited selection of continental breakfast items, soups, salads and sandwiches. Soda, juice and alcoholic beverages can also be ordered; they will be charged according to the current in-cabin mini-bar pricing list. Room service is free on Caribbean sailings, but it's good to keep a few dollars on hand for tips. A small fee (roughly 3 to 5 euros, plus a 15 percent gratuity charge) applies to each room service item (excluding breakfast items) ordered on cruises in Europe. Beverage packages come in four types: Cocktail Package (12 cocktails for $69.50), Peter Pan Package (10 milkshakes, mocktails, sodas or juices for $25), Teen Team Package (seven Red Bulls or mocktails for $45) and Large Draft Beer Package (14 14-ounce beers for $56.40). Although all-you-can-drink alcohol packages are no longer available for purchase once onboard, passengers can buy prepaid all-inclusive packages in advance for $61 per day. A 15 percent gratuity is added to all prices listed. If you normally drink a lot that's not water or iced tea, you'll come out ahead by signing up for one of these.